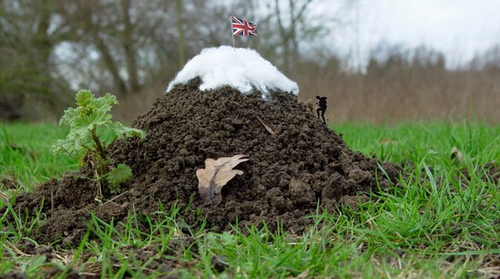 Triumph and the Molehill of Non-Realtor MLS Choice – Notorious R.O.B. Rob had a fascinating “what if” yesterday. In a nutshell, after NAR MLS policy changes this year, Realtor MLSs divest some of their Realtor ownership so they can avoid NAR policy, and stave off their impending defeat at the hands of non-Realtor MLSs. If you’ve read Rob’s work long enough, you may at some point have been reminded of Triumph the comic dog. It’s usually genius. But no matter how good things seem to be going, at some point he’s going to go into full conspiracy mode and make someone’s mood go in the toilet. It’s like the gift and curse of the paranoiac (said with love, of course). So let’s deal with the Armageddon scenario of MLS of Choice forcing all MLSs to shed their Realtor status: not because it isn’t plausible, but because in practicality it’s a mountain out of a molehill. TL;DR: Realtor MLSs aren’t going to leave Realtor status. Rather, they’ll embrace the change brokers have asked them for, and benefit in contrast to those who don’t. Non-Realtor MLSs exist in a number of states. They exist alongside Realtor MLSs. The non-Realtor MLS participants and subscribers are not required to pay Realtor dues (though many do). The non-Realtor MLSs’ subscribers don’t have to pay ~$600 Realtor dues annually, and these MLSs are not governed by NAR policy. So they’re not required to give waivers to agents who already subscribe to a different MLS. This is their competitive advantage that is the crux of Rob’s argument. Realtor MLSs today are not clamoring to lose their Realtor status and allow non-Realtors to join. As a matter of fact, most hold it as a badge of honor. The largest and fastest-growing MLSs continue to be Realtor MLSs. Issue 1: Will new non-Realtor MLSs spring up everywhere? Rob says non-Realtor MLSs might have such a competitive advantage in a world with mandatory waivers for Realtor MLSs, that non-Realtor MLSs will become the norm. Let’s take his scenario where Top Agent Network creates its own non-Realtor MLS. They can do so today. As a matter of fact, why not call them that right now? The Top Agent Network MLS exists, and it’s non-Realtor. The only change in our new scenario of “MLS of Choice”, or updates to NAR’s MLS Policies 7.42 and 7.43, is that the Realtor MLS must give agents, whose brokers are participants in the Realtor MLS and who subscribe to Top Agent MLS, a waiver of subscriber dues–if those agents certify that they will not use the Realtor MLS’s services in any way. But the agents do still want access to the Realtor MLS. They need it. For all the clamoring about doing business off-MLS in private networks, virtually every agent and broker doing business in one of these private networks is also doing business in the Realtor MLS as well. That’s because MLSs don’t just appear out of the blue. They require massive amounts of preparation and cooperation between many brokers in a marketplace to be sustainable. If either of those don’t exist, the MLS will fail. So there’s no reason to think that new non-Realtor MLSs will appear and eat up Realtor MLSs’ market share. There’s too much inertia in place with existing relationships and ongoing business for that to happen without a major effort from a powerhouse coalition—and no visible desire for it. Issue 2: Would current Realtor MLSs move away from Realtor status to avoid Realtor policy? Think about the value of the policy changes that have been put in place. They were requested by brokers. They were analyzed by NAR’s MLS advisory board and CMLS. They were put through a year of scrutiny and feedback from the industry. Brokers overwhelmingly supported the changes, the MLS committee agreed, and NAR’s board of directors passed the policy as an improvement to broker/MLS relationships. This was MLS strategic planning on a nationwide scale: future-proofing for the industry. That kind of a researched, vetted business change is a policy benefit for Realtor MLSs and their relationships with their customers. A broker in a multi-MLS environment will prefer to work with MLSs that appease them by granting their request: agent flexibility. The overwhelming support of brokers for the recent policy changes clearly shows that this is what they want. If a broker’s agents can join 1, 2, or 3 Realtor MLSs, and only pay for those which they need, the broker wins. The broker might even join more MLSs. If a non-Realtor MLS continues to charge for all of that broker’s agents (not employing waivers), even though only a few agents use its services, the broker will either not participate because of the prohibitive costs, or swallow the bitter pill and resent it. Is it really cheaper–or better? Allowing agents to avoid Realtor dues isn’t a net benefit to a broker who is forced to pay 100 MLS subscriber dues for 10 agents who need those services. Might not that broker encourage another more flexible MLS to move into that service area and compete, if the non-Realtor MLS is inflexible with subscriber costs? It’s not crazy. But competing means providing value and growing a customer base. Not having to pay Realtor dues will be seen as a benefit to some. The best competitive decisions, though, provide more benefits to more customers. In direct contrast to Rob’s scenario, I’d predict that enlightened non-Realtor MLSs will adopt a waiver policy similar to NAR’s “MLS of Choice” voluntarily. When the MLS’s ultimate customers, brokers, see their needs being met by one organization and not another, we know where their business and their loyalty will eventually reside. If you believe the future of MLS is cheaper, the flight from Realtor status is plausible. If you believe that the future of MLS is better, as I do, Realtor MLSs are on the right path to stronger relationships with their customers. Disagree? Let’s hash it out. Sam DeBord is VP of Strategic Growth with Coldwell Banker Danforth in Seattle. He is Past President of Seattle King County REALTORS and Vice Chair of the National Association of REALTORS’ MLS Issues and Policy Committee. PreviousPrevious post:Will Non-REALTOR MLS Be the Norm? So I have a new definition for the brokerage industry to digest. “An MLS is an organization, that for the most part, sells memberships to non-productive brokers and agents with the promise of mandating the cooperation and compensation of productive brokers and agents.” And so if anyone thinks that this type of organization makes sense now and will enjoy a long and prosperous life given the highly competitive nature of this business, and all of the complex challenges that are facing the real estate brokerage industry today, I would highly suggest that you may need to think again. As usual, Sam puts things in perspective. The Armageddon scenario of MLS of Choice is not likely. I believe that MLS of Choice will encourage competition between MLSs and result in more participation in MLS, not less. Many of the MLSs, which will be effected by MLS of Choice, are small. Due to this, they often are unable to offer the same cost effective and abundance of services, that a much larger neighboring MLS offers. Some small MLSs only existed because of “Territorial Jurisdiction” and the lack of competition, because they could survive by forcing Agents to join. In the near future, thanks to MLS of Choice, we will see MLS mergers, improved services, and more cost effective membership dues. The end result will be MLSs that are more attractive to both Brokers and Agents. For example, here on the Treasure Coast of Florida, we have two local MLSs that refuse to share data with their neighboring MLSs, and survive by enforcing “Territorial Jurisdiction”. In anticipation of MLS of Choice, the neighboring larger MLS, just expanded to allow data in those two areas to be put into their MLS. The end result is that Brokers and Agents will now be able to join just one MLS, instead of three. I personally think it pure professional lunacy to give one damn about those licensed agents who are trying to avoid the puny Realtor dues. I don’t think the various associations provide REAL benefits and I highly resent the fact that at least 40 NAR “executives” are reportedly being paid more than $400k per year. Regardless, the dues are a small fee to do business where I’m repeatedly paid $10k for 20-hours of work. Who cares who runs the MLS? My MLS (Bright) runs in 4-states, more territory than I’ll ever find interest.